Courier – Carries messages to other teachers, office, etc. At the end of the day, help Floor Crew. Desk Inspector – Checks for dirty desks (and gives students Clorox wipes if needed); assists in cleaning desks. The Desk Inspector was in charge of reminding me to do a random desk inspection. If a student passed an inspection by the Desk Inspector, they got something from the prize box. Sometimes I would do my own inspection at the same time. If a student didn’t pass my inspection, they had to stay in at recess to clean out their desk. Equipment Manager – Checks in and out equipment (by writing name, date and equipment) it in the spiral notebook at the back of the room; At the end of the day, help Floor Crew. Floor Crew – Pick up trash off the floor at the end of the day. Push in all chairs before leaving the room. 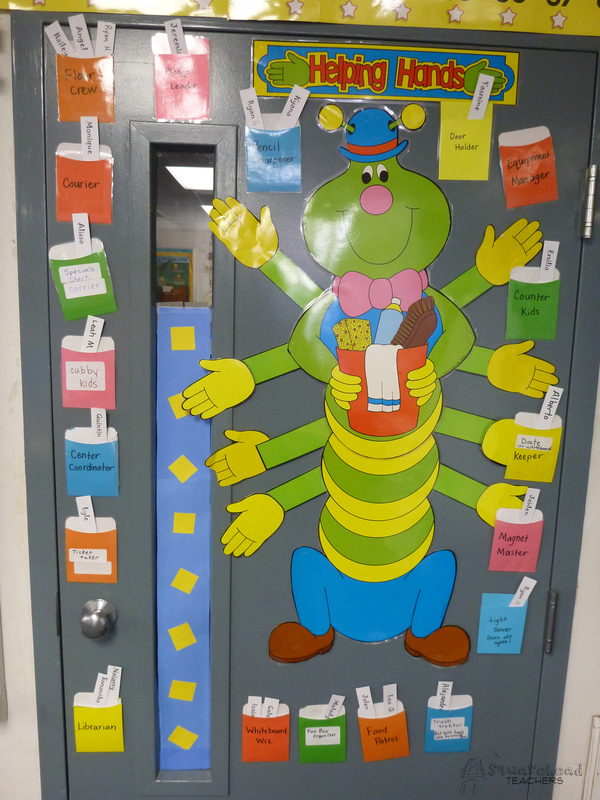 Librarian – In charge of the class library, makes sure books are organized books (all facing the right direction). Helps students check out books (at the end of the day, call for book checkout. Students who have would like to check out a book will come tell you and you’ll write it down on the clipboard). Line Monitor – Waits for the line to be ready (1, 2, 3 fingers in the air as the class progresses to be ready). When the class is silent, still and facing forward, the line monitor holds the door for class and turns out the lights. Join the line at the end of the line. At the end of the day, help Floor Crew. This was especially awesome because I could do last minute things while the monitor was watching the line. They were encouraged to give compliments to students who were behaving (I’d let the first 2 students complimented go to the first line stopping point ahead of everyone else, so they ended up getting to go first to lunch or whatever). 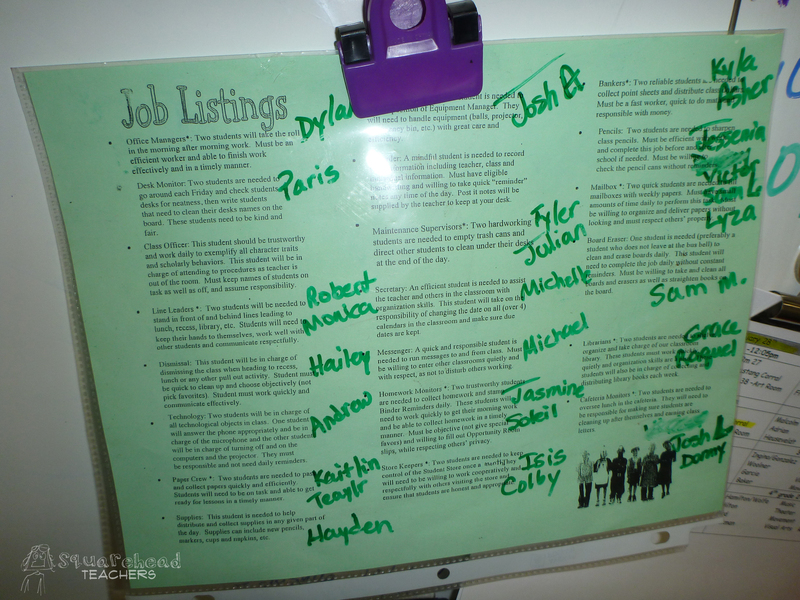 Mailman – Passes papers (from the plastic box) back to students’ mailboxes in the back of the room (when done with an assignment or during after-lunch read aloud); makes sure all students empty mailboxes every afternoon. Call students names to remind them if they haven’t emptied their boxes. Pencil Sharpener – Makes sure the class supply of sharpened pencils is full every afternoon. When it’s time for jobs, sharpen as many pencils from the “broken” box until it’s time to go. 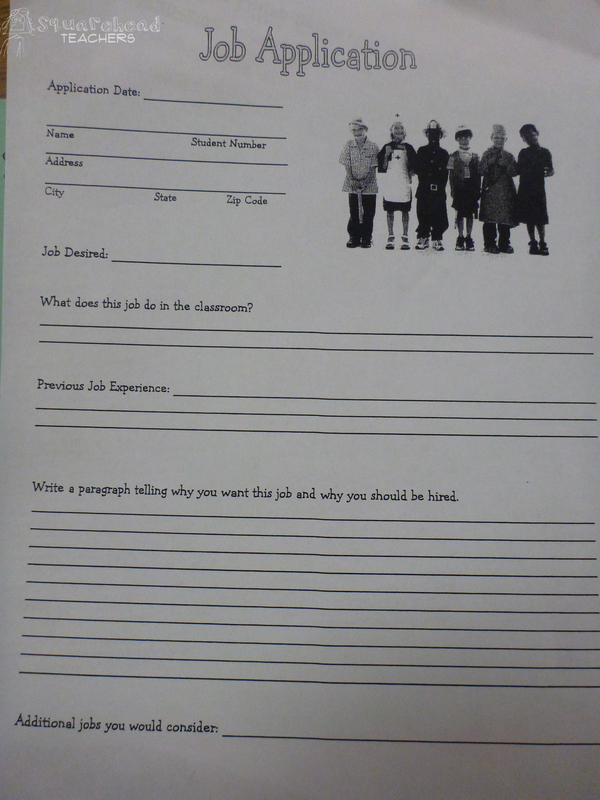 Pocket Master –Reports to the teacher in the morning which students are absent. Make sure all popsicle sticks from the lunch count are moved back to each student’s pocket at end of day. Secretary – Fills out a “While You Were Out” form and collects worksheets, etc. for each student absent that day. At the end of the day, put form in student’s mailbox. Time Keeper – Calls time for jobs at the end of the day then reports to the teacher for any special jobs. If no special jobs, help Floor Crew. I had a special set of bells they rang to signal time for jobs. Whiteboard Wiz– Erases whiteboards at end of the day. Ask the teacher if there’s anything that should not be erased before you start erasing. 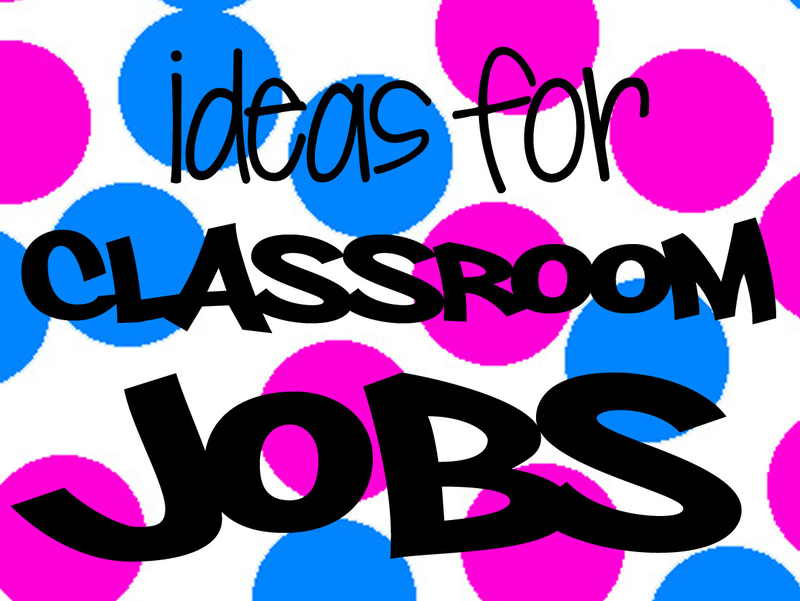 Have other good classroom jobs ideas? What have you tried that works (or doesn’t!)? Please comment! 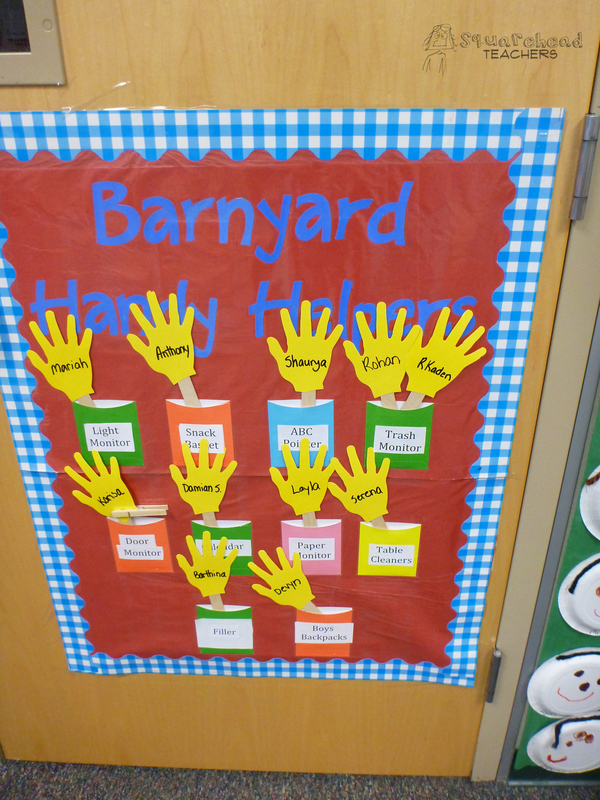 This entry was posted in Classroom & Decor, Management and tagged Children, Education, Elementary School, Kids, Teacher Resources, Teachers, Teaching by Squarehead Teachers. Bookmark the permalink.